Have a great Halloween weekend, with or without pumpkins. Maybe it is time to try one of the recipes Kalm noted down? Pehr Kalm (1716-1779) was a naturalist, explorer, agricultural economist and priest from Finland, who studied with Carl von Linné (Carolus Linnaeus) in Uppsala, Sweden. He traveled in Sweden, Finland, Russia (1742–1745) and later to North America (1748–1751), visiting Pennsylvania, New Jersey, Niagara Falls, Montreal and Quebec. Kalm wrote a journal of his travels to North America, 'En resa til Nord America', which was published already during his lifetime in four different languages. 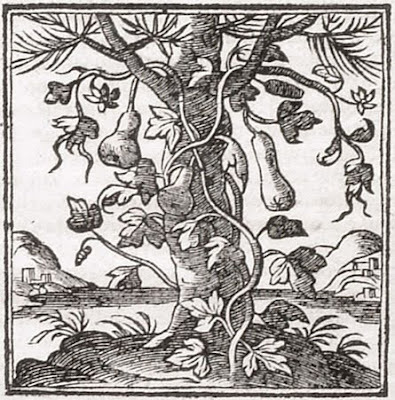 Picture from Glasgow University Emblem website: a print from 1621 with a gourd climbing up a pine, representing "transitory success". It's good to know that pumpkin roasting is an ancient art, we harvested nearly 250 ponds of squash and pumpkins this fall. I love them roasted with butter salt and pepper. I'm also glad to see you got some of Marian's plants, it's sad to see that garden go. It made me truly think about the impermanence of everything I do, even planting trees.